PLANET in PERIL, your "one-stop shop" for the truth about our planetary crisis. : Is B.C. headed for another devastating summer of wildfires? 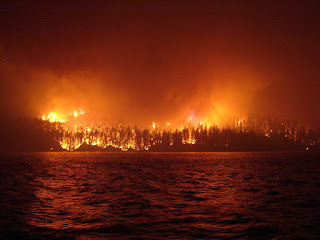 Ashcroft Reserve wildfire as seen across Loon Lake, BC. July 2017 Photo by Shawn Cahill. With warm weather, a high snowpack and floodwaters rising throughout the province, it may seem like B.C. is set to repeat last year’s weather patterns, which led to a catastrophic summer of fires. But it’s still too early to reliably predict…. More here.